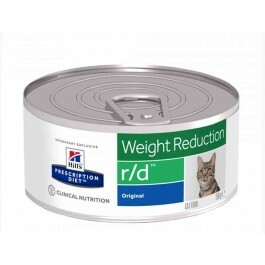 Hill's Prescription Diet Feline r/d was designed specifically for the management of weight problems in cats. Fibre-responsive conditions in overweight cats: diabetes mellitus, colitis and constipation. Low in calories and fat to help promote weight loss. High in dietary fibre to help reduce hunger and discourage begging. Supplemented with L-carnitine to help burn fat and preserve muscle.